Based in Orlando, the University of Central Florida (UCF) is indeed one of the largest universities in the country offering over 215 programs. A best-value university and a talented faculty team are a couple of influences to its large enrollment year after year. 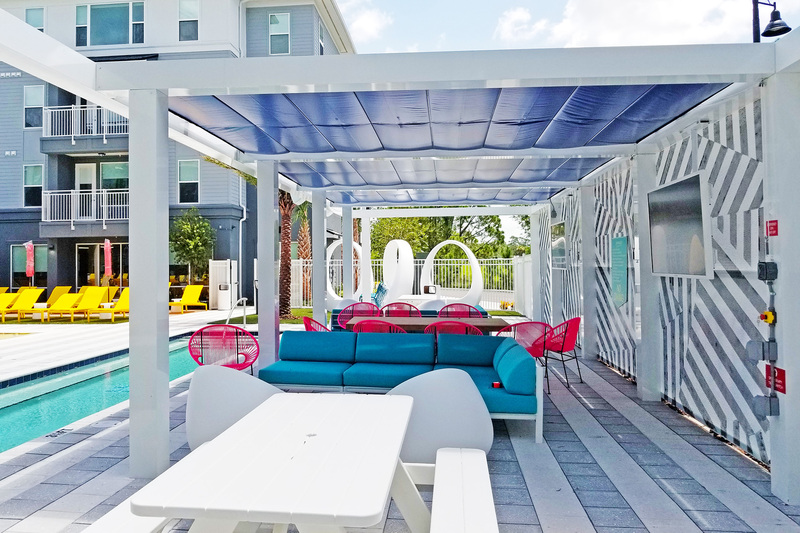 When it comes to student housing, there are hundreds of options for students to explore. For instance, single home rentals to apartment communities, from on campus to off campus – there is something suitable for every lifestyle. 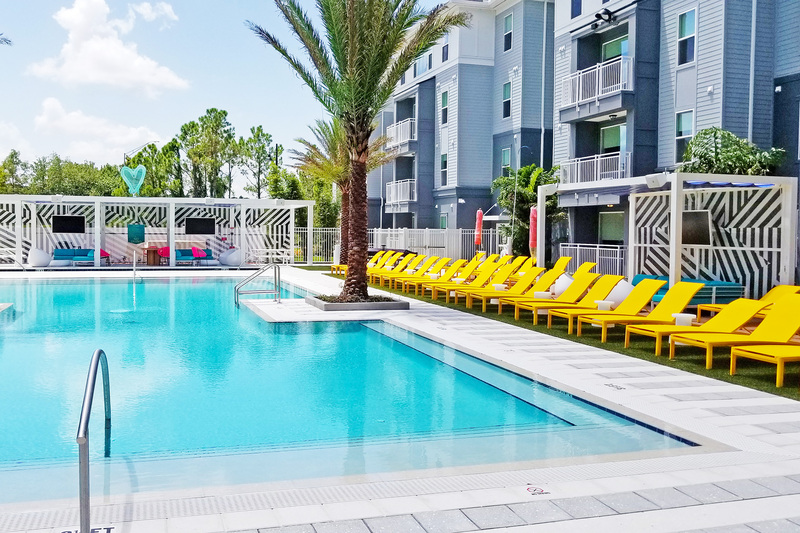 Students can gain the most from their college experience at the all-new Hub on Campus Orlando, a luxury student housing facility. 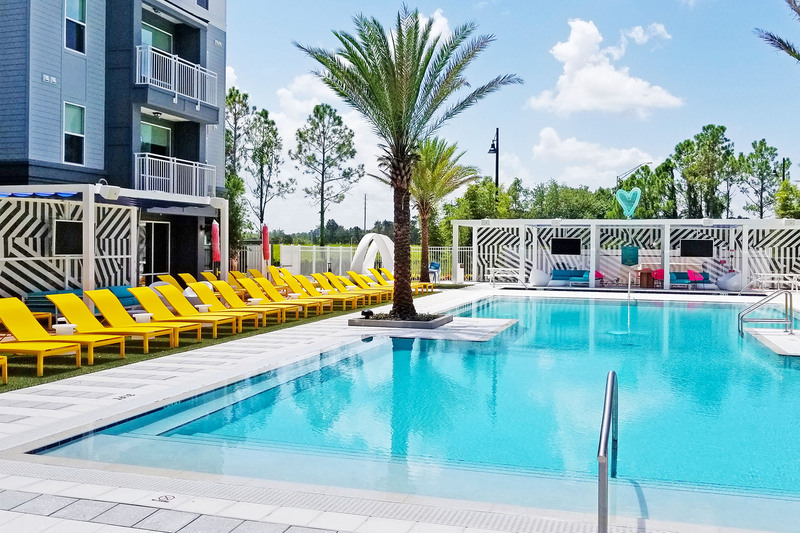 This resort-style residence features amenities including a rejuvenating spa, sand volleyball courts, a top-line fitness center as well as spacious, private rooms. The HUB stands well above competition and is just a short drive to campus. 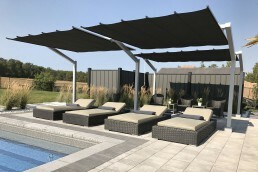 With so many outstanding amenities, Barfield Fence and Fabrication enhanced the sundeck with their unique and elegant design. 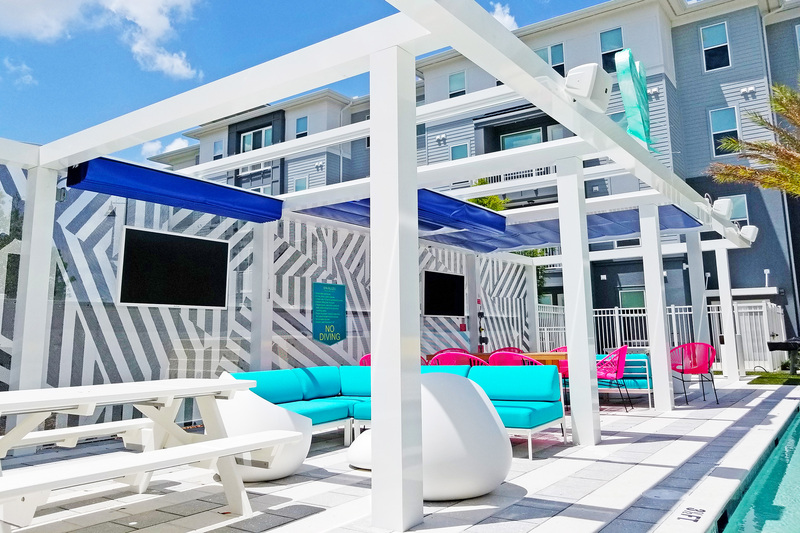 They customized several modern cabanas specifically creating an inviting space where students can mingle and relax poolside. 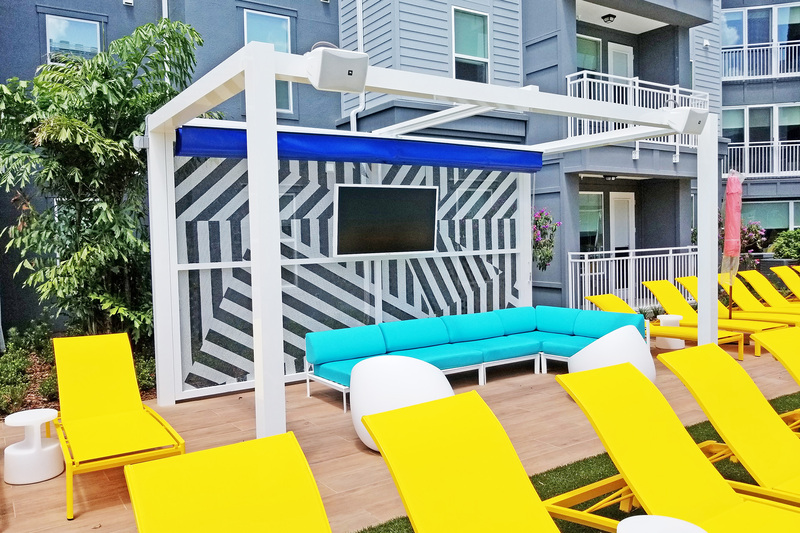 – Lindsay B. Whittaker, Barfield Fence & Fabrication, Inc.
ShadeFX tailored multiple rope driven retractable canopies in Arcade FR Blue. Three canopies were placed on a multi-bay cabana at the end of the sundeck, providing nearly 500 sq. ft. of coverage. 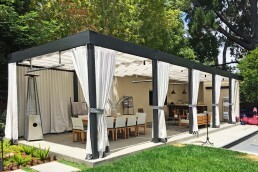 ShadeFX also fabricated two 8’x18’ canopies placing it on opposite sides of the pool, completing the luxurious patio. 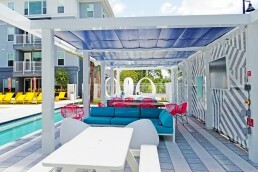 Consequently, residents at the Hub on Campus Orlando are always in vacation mode. Students leave stress in the classroom and focus on all other aspects of college life, with perks you wouldn’t expect. 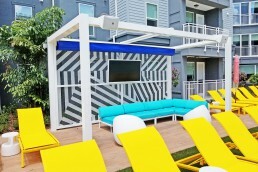 Add a modern touch to your poolside cabana with ShadeFX. See what we have to offer. 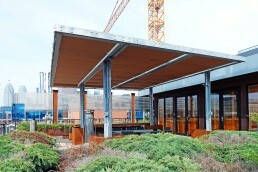 ShadeFX tailored multiple rope driven retractable canopies in Arcade FR Blue. 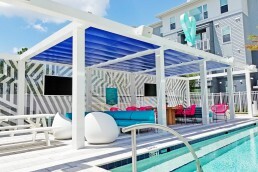 Three ShadeFX canopies were placed on a multi-bay cabana at the end of the sundeck, providing nearly 500 sq. ft. of coverage. 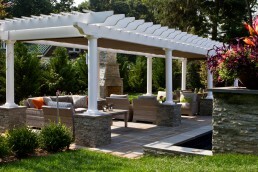 Two additional 8’x18’ canopies were placed on opposite sides of the pool, to complete the luxurious patio.